THE BRANDING PROJECT came to id8 to help promote the Marietta Square. After an initial assessment of the situation, id8 determined that merely promoting the Square was not enough; a new, clear brand that would find its true voice and identity was needed. The Marietta Square has a rich heritage, but a progressive culture also flows through it—historic architecture and brick sidewalks serve as a backdrop for undiscovered art galleries, hot new restaurants, neighborhood gathering spots, and great shopping. After a thorough analysis, however, id8 determined that these assets, despite their energy and excitement, were not the Square’s true brand. The issue: Inconsistency. There was no consistency in look, the messaging, the colors used throughout the Square. Even what the area was referred to by residents, visitors, and business owners was inconsistent. And as marketing tells us, in the absence of a strong brand, people will not remember you, no matter what you have to offer. 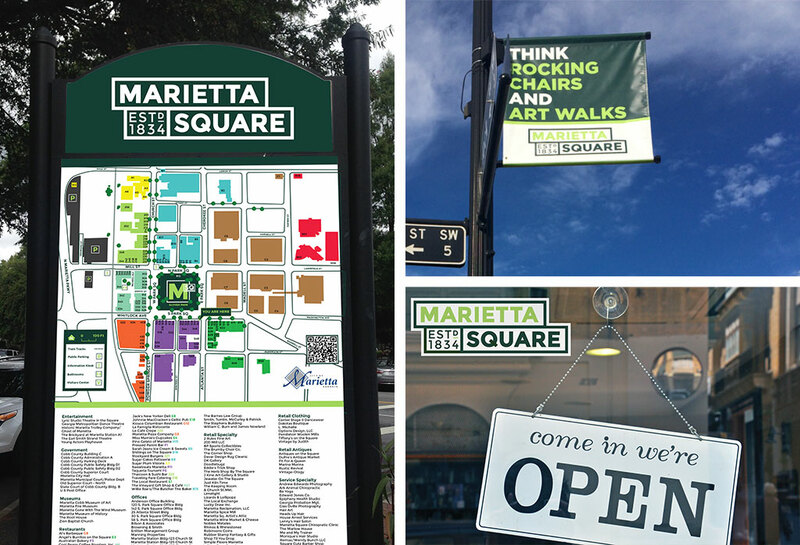 The Marietta Square needed just that: a strong, memorable brand, complete with a name, a logo, and a story. “Smart. Strategic. Authentic. Honest. Effective. Fresh. To kick off the project, id8 headed out into the Square itself to see what its people had to say about their community. We conducted interviews with community historians as well as the “man on the street.” As ideation began, an image of the bricks that pave the streets and serve as the foundation of many buildings could merge the history and progress of the Square together into a strong, united brand. A uniquely authentic city center where you can enjoy in-town culture with small town charm.